After FDR’s successful reelection in 1944, the HDC devoted its energy to other legislative priorities. In particular, as World War II wound down, the organization adapted its “win the war” strategies to reconversion and post-war peace efforts. Three key issues structured this “win the peace” campaign: the passage of the Bretton-Woods Agreement to ensure world economic security, international cooperation through organizations like the United Nations, and civilian control of atomic energy. A host of print materials including scripts from public meetings and performances, programs and speeches from academic and professional conferences, and brochures for public consumption testify to the organization’s energetic activity in this period. The HDC’s campaign for peace also offers an opportunity to focus on some of the performances created by the organization. 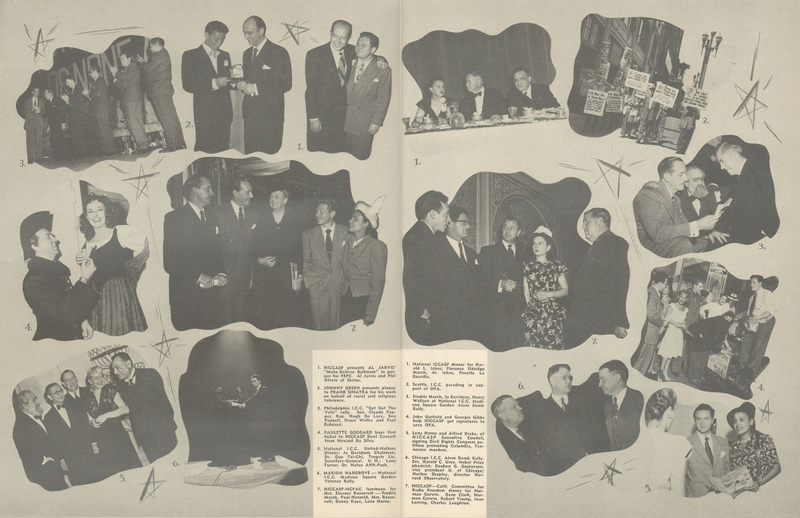 Existing scripts and speeches of programs like “The Crew of the Model T” and “American Caravan” offer a remarkable record of nationally broadcast media texts that straddle the lines between Hollywood production and independent media, socially-motivated art and entertainment, and government collaboration and government interference.